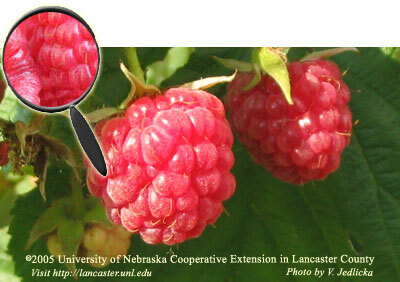 Raspberries can be successfully grown in Nebraska. They are grown primarily by the home gardener and used fresh or frozen, in jams or in jellies. The red, yellow, black, and purple raspberry types are grown in eastern Nebraska, while western Nebraskans primarily grow only red berries. Pruning has a major impact on the production of quality raspberry fruit. It can affect growth rate, fruit number, size and disease susceptibility. Upcoming Workshop - Acreage Owners Rural Living Clinic: Raising Small and Tree Fruits for Home or Commercial Use, February 2005. Details. The results looked "berry" good for berries in 2004 when United States Department of Agriculture (USDA) researchers released a list of the top 20 antioxidant-rich foods in a study of over 100 commonly consumed foods tested (Journal of Agricultural and Food Chemistry, June 9, 2004). Wild blueberries, cultivated blueberries, cranberries, blackberries, raspberries and strawberries took six of the top 11 spots. Did you miss a Can You Guess It?? Find past photos and resources here.